in excellent condition on its original card. It measures 2" in diameter. 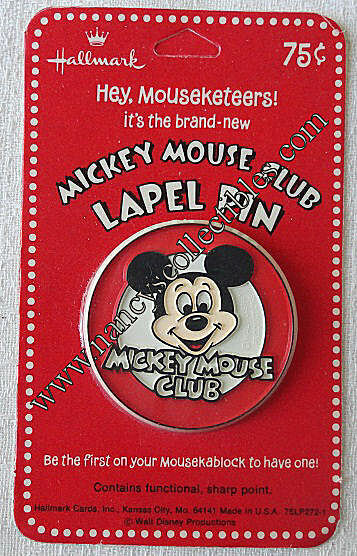 in U.S.A., 75LP272-1, Be the first on your Mousekablock to have one!". 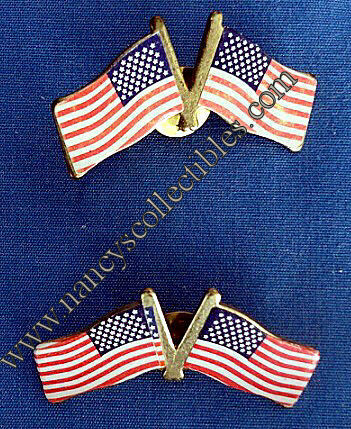 A double American Flag lapel pin. The flags cross at the post. 1" tall; 1-5/8" wide. It is unmarked. Inc. K.C.,MO, Made in China, JLP2754". 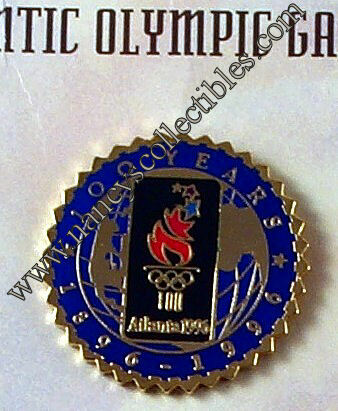 A Hallmark 1996 Authentic Olympic Games lapel pin. This is one of six. cellent condition on the original card. It measures 1-1/8" in diameter. Inc., Kansas City, MO, Made in China, 1992 ACOG, SOL1006". Cards, Inc. Kansas City, MO, Made in China,#VJW111". is outlined in gold. It is a plastic magnet. It is in excellent condition. It measures 1-3/4" tall. 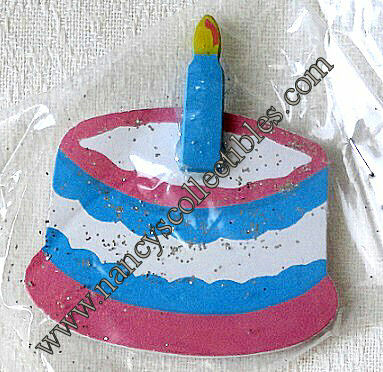 The magnet is marked "Hallmark Cards, Inc.". outlined in gold. It is a plastic magnet. It is in excellent condition. 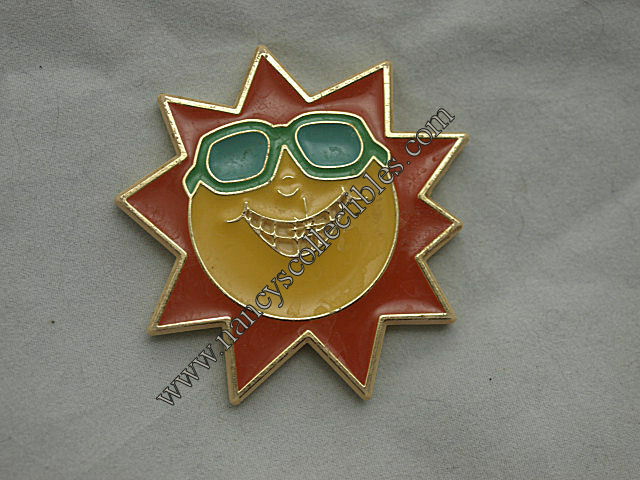 is yellow with red-orange rays and green sunglasses. excellent condition. It measures 2-1/2" in diameter. 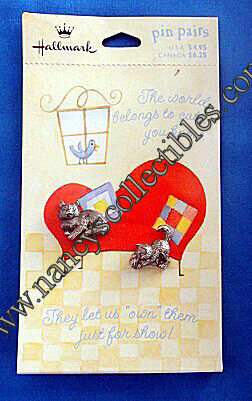 The magnet is marked "Hallmark Cards, Inc.". 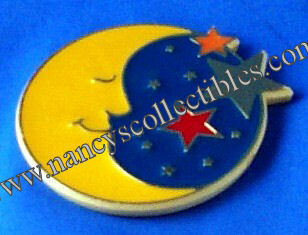 A Hallmark crescent moon with stars on a blue background magnet. glitter, and a blue candle. Perfect for a first birthday party. 2-1/2" wide. It is marked "Knobler, Made in Taiwan". and a black, brown, and white tail. He is holding a blue flower. 1-1/2" tall. It is marked "Hallmark Cards, Inc., Made in Hong Kong". Cards, Inc., Made in Hong Kong". 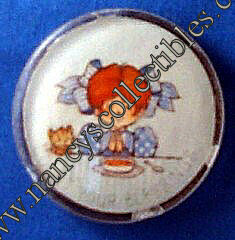 measures 1-1/2" tall. 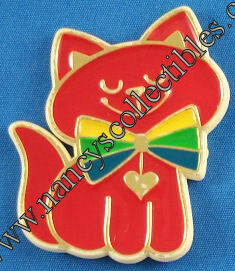 It is marked "Hallmark Cards, Inc., Made in Hong Kong". 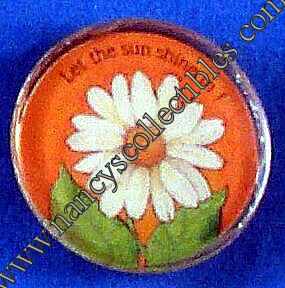 A disc Hallmark magnet with a white daisy on an orange background. magnet. It is in excellent condition. It measures 1-1/2" in diameter. It is marked "Hallmark Cards, Inc.". 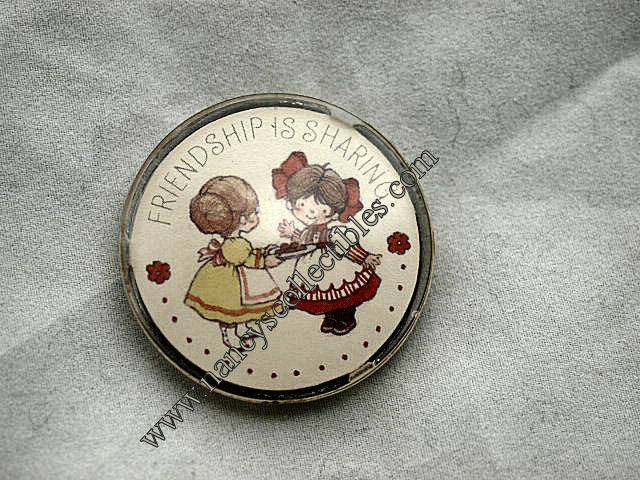 A disc Hallmark magnet with a two girls sharing a plate of cookies. 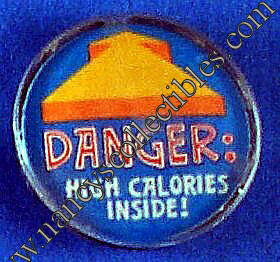 A disc Hallmark magnet with an orange geometric design on a blue background.